The house lights are blinking on and off, friends, a sign that the intermission is over and we’re starting up the ceremony again. Part Three will be posted soon, too. There’s a lot more to come. But first, this quick word from our sponsor: we usually show the regular retail price of these recommended books, but if you buy them from us, we will deduct the 20% BookNotes discount for you. Our website order form page (see the link below) is certified secure and you can safely leave credit card digits there. Or, you can ask for us to just send you a bill and you can pay by check, later. Just tell us what where to ship and who to bill. Or, we’d love for you to give us a call at the shop at 717-246-3333. Tell us that you saw the reviews at BookNotes. Thanks again for making 2014 a great year for publishing, for reading our reviews and for sending orders our way. We wouldn’t be here without you. 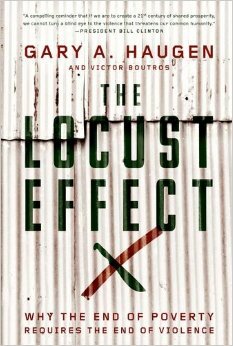 The Locust Effect: Why The End of Poverty Requires the End of Violence Gary Haugen & Victor Boutros (Oxford University Press) $27.95 There is little doubt that Mr. Haugen, who founded the International Justice Mission (IJM) and helped put sexual trafficking and contemporary slavery on the modern-day map, and has valiantly worked to liberate untold thousands, knows as much about structural evil and systemic violence than anyone on the planet. A thoughtful, prayerful, bold Christian, he has lead IJM to partner with lawyers, courts, police and governments throughout the world to work for reform of policies and enforcement of laws protecting the vulnerable. In the magisterial Locust Effect, with the help of a young activist-scholar, they lay out the bigger picture, the need for the rule of law, the relationship of injustice and disorder, and how to establish greater public justice in places that are desperately in need of shalom. This book is one of the finest examples of thoughtful, accessible, inspiring, social justice advocacy, and a major contribution to the fields of global poverty and justice. From one of the world’s oldest and most prestigious academic presses, too. 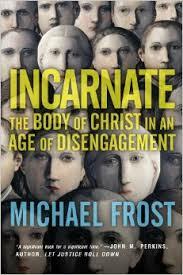 We were thrilled to be among the very first to review this (see my BookNotes review, here.) Surely this is one of the most important and best releases of 2014. 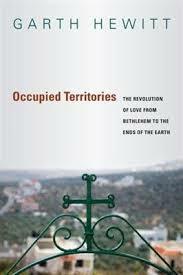 Occupied Territories: The Revolution of Love From Bethlehem to the Ends of the Earth Garth Hewitt (IVP) $16.00 A friend got to me an advanced copy of this manuscript earlier in the year, and I zoomed through it, eager to learn more of this amazing story. What a book! Garth Hewitt is a global justice advocate and peacemaker (working worldwide through his human rights organization, the Amos Trust) and I am thrilled that this book came our way. It is very compelling. He is also a great singer-songwriter who I discovered decades ago (maybe alongside Mark Heard, or shortly thereafter.) He has served on the board of the world famous Greenbelt rock music festival in the UK and is a canon of St. George’s Anglican Cathedral in Jerusalem. When he is in London, he serves as an associate priest of St. Clement’s Eastcheap. You can even hear him on the BBC (Pause for Thought.) Which is all to say he is a tireless Christian servant, commitment to public justice work, but deeply connected to the local parish and to worship, even while he spends time touring, researching, serving, speaking out, working into his calling as a “folk theologian” and human rights activist. Occupied Territories documents how this “revolution of love” works, as he draws attention to the plight of those in poverty, violence, and repression. Hewitt’s is not a partisan political project, nor is his mission work driven by trendy causes or ideology. In Occupied Territories he is clear about Christ, about deep things of faith, and about how discipleship calls us into the fray, leading with love to build a new way. There are powerful stories here, excellent Biblical exploration, and useful study questions to help reader process this call to live out the gospel in relevant, healing ways. 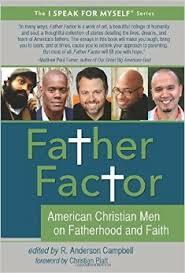 This would be great for a book club, for a discussion group, for a Sunday school class. And it is perfect for a Hearts & Minds Best Book of the Year Award — we honor this with great gratitude that there are people doing this kind of work, sharing their stories, and offering their faith to inform and inspire us. Artist Cindy Kiple who designed the book cover, too, deserves a special award — just wonderful! Cheers! Check out his website, here. Overrated: Are We More in Love with the Idea of Changing the World Than Actually Changing the World Eugene Cho (Cook) $15.99 In Part One of this Best of 2014 list, we touted the very sober, practical, useful guide to sustaining social activism by my friend Ben Lowe, Doing Good Without Giving Up. It deserves its good place on this award show, and we think it is very wise, and a much needed companion for many. 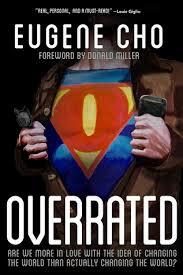 Overrated by the hip Seattle pastor Eugene Cho is similar, but deserves its own moment in the sun. It is exceptionally passionate, really strong, and explains how God does indeed expect us as Biblical people to stand for the poor, resist oppression, and commit ourselves to being servants of others, involved in projects which show charity and even become advocates for social reform. So it does that well, really well. It’s genius, though, is its generosity, its humble, almost comical tone — “a confession, painful and honest,” Cho says. But yet, this guy understands our dilemma: it is harder to live this stuff out than it is to just talk as if we’re doing something. Sure, who doesn’t want to make a difference, leave her mark, serve the poor, fight the powers. But how do we do that? Start by knowing what the Bible really teaches, and this is a nice intro to good theology. Then get serious, even as you have fun being challenged and recharged. Lynen Hybels, who has been on quite a journey herself of late, says, “I read every word and pondered what I read. Overrated challenged and chastised me, inspired and energized me. I highly recommend it.” No “hipster coffee-shop talk of justice” here, says Shane Claiborne. Cho “dares you to dive into the trenches and do something…” Let’s not just talk about a better story, let’s actually live a better story. Fantastic. See his organization One Day’s Wages for lots of great ideas and ways to join a network of grassroots activists against global poverty. The Hobbit Party: The Vision of Freedom That Tolkien Got, and the West Forgot Jonathan Witt & Jay W. Richards (Ignatius Press) $21.95 I will have a brief review of this published shortly in the Center for Public Justice’s Capitol Commentary and there I note how very interesting this is, how persuasive it is at times, and yet hint at how it finally fails as uniquely Christian theoretical work. That is, while it is exceptionally fluent in classically understood conservative Catholic social theory, and how The Lord of the Rings and other Tolkien masterpieces assumed and imagined a world that is shaped by this sort of worldview, it is less than clear why this is, in fact, the most theologically-sound, Biblically-warranted orientation. 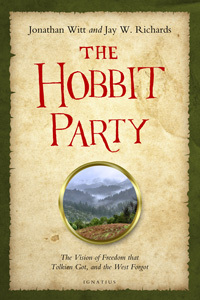 These brilliant writers are passionate about all things Middle Earth and that makes The Hobbit Party well, a party, almost; it is not only delightful to read, but very helpful, since they can help us appreciate the social, political, economic, and ecological views that informed the Shire, and the hobbit journey towards freedom. I enjoyed this book, learned much, commend it to others – perhaps especially those who haven’t grappled with the serious, freedom-loving localism of the sort explained here – even though I may not fully agree with their nearly libertarian worldview. Agree or not, this is a book to enjoy, to ponder, to discuss, to help us more accurately understand the fantasy novels that some say are the most important literary works of the 20th century, and to understand how to think creatively about communicating theories of natural law, public justice, cultural renewal in a post Christian society such as ours. If only other political theory books would be so interesting! Kudos. 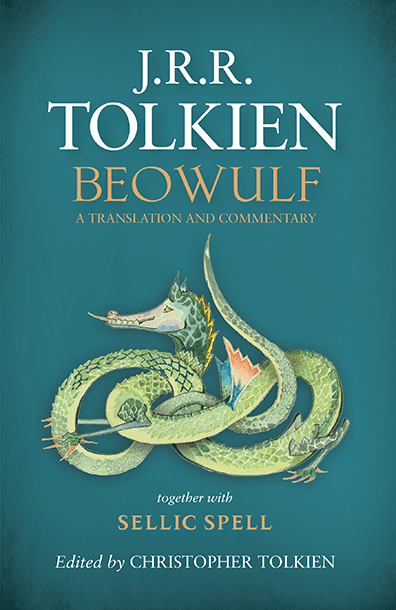 Beowulf: A Translation and Commentary J.R.R. Tolkien, edited by Christopher Tolkien (HMH) $28.00 At last, 2014 saw the legendary and long-awaited release of JRR’s translation of this great Anglo-Saxon classic. Perhaps you, like me, didn’t get this as a high school kid. Perhaps you loved the passionate re-telling by Irish poet Seamus Heaney. Perhaps you just want this great classic in your library, but never knew which edition to purchase. Well, this is a handsome, must-read version for those who want to understand the epic poem — more than half the book is commentary! And, I suppose, it is also nearly a must-read volume for any true fans of the learned, pipe-smoking Inkling. Hear, hear. 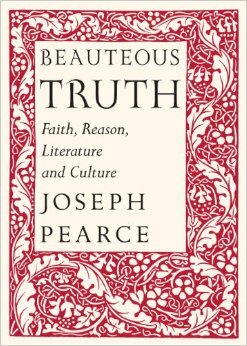 Beauteous Truth: Faith, Reason, Literature and Culture Joseph Pearce (St. Augustine’s Press) $30.00 Speaking of exceptionally learned, very conservative, radically insightful Roman Catholics, Pearce is, for some, nearly an acquired taste; he is so profoundly, classically trained that many will see him as beyond a curmudgeon and anti-modernist. But yet, despite his quirks that some might think to be “so medieval” and anti-popular culture, this book is not only wise, it is fun; Thomas Howard gets it just right when he says it is written with brio. What a joy to read such elegant and exquisite prose, in such a very sturdy, handsome volume. In this great work he offers short essays about writers, writing, theology and philosophy as seen in literature, some of which were published in First Things, The Chesterton Review, and the Saint Austin Review. 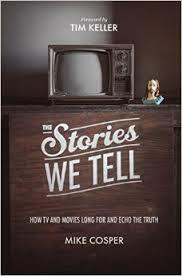 The Stories We Tell: How TV and Movies Long for and Echo the Truth Michael Cosper (Crossway) $15.99 There have been oodles, just oodles of books in recent years about Christian engagement in film, video games, TV, rock music and the like. Popular culture and media studies remain large sections of our store, and we are noticing an increasingly specialized bit of work coming out, seriously Christian and deeply studious; a few of these are a bit obtuse, though. So it is just lovely, and very, very helpful, to have a really good, entry level, thoughtful, fun book by a theologically reliable author, ruminating about our love of TV and movies. Why do we tell stories? How can the popular art of modern media inspire us? (Should it?) And how might it be a distraction, or worse? From the good and the bad, including the very bad, to the wise and the cruel, from the ponderous to the funny, this book really gets our deep desire to connect to stories, and to be entertained by our modern digital storytellers. I loved this book, appreciate it’s fine and faithful intentions, and its upbeat writing style. The author isn’t a scholar of postmodern literary theory, he isn’t a media professor – in other words, he’s not like the guy in the famous movie line in Annie Hall that pontificates loudly about all manner of abstract stuff (until Marshall McLuhan himself steps in and rebukes him!) Yep, this is fun, funny, entertaining, and calls us to a Godly, wholesome, good appreciation of modern popular culture. A very impressive foreword by Timothy Keller is wonderful. This is a fantastic book. Cheers! 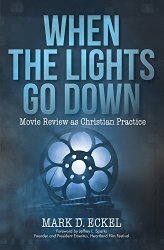 When the Lights Go Down: Movie Review as Christian Practice Mark D. Eckel (Westbow) $19.95 You gotta love a book about a guy who yells at the screen in the darkened theater, embarrassing his wife or kids. You gotta love a book by a guy who loves movies so much he has a endless repertoire of examples, case studies, scenes and stars, to make any number of helpful points. You gotta love a book by a fellow who teaches film in a local community church Sunday school, teaching church-going evangelicals how to understand narrative and script and lighting and such. This is not an overly pious handbook of what to watch and what not to watch, it is a Biblically-rich, worldviewish companion to nurturing the art of thoughtful Christian engagement. As a Christian practice. As Eckel reminds us early on, “A projector’s light can reflect light from heaven.” Not only does he offer succinct introductions to various philosophical matters below the surface in most films, he gives clear-headed and often fascinating points to ponder, and guidelines to consider as we attempt to relate our faith and our movie-watching. Throughout When the Lights Go Down he also has interviews with serious film scholars, critics, and film makers. What a treat. This is an entertaining study, well designed with plenty of good information, inspiration, and Biblical wisdom. Oh yeah, and did I say he shouts at the screen sometimes? This guy loves going to the movies, and he helps us enjoy it all the more, too. Soli Deo Gloria. Thanks, Mark. Theology of Missions: A Believers Church Perspective John Howard Yoder (IVP Academic) $45.00 Despite the outrage over grave injustices perpetrated by this Mennonite scholar in his lifetime, there is no doubt that he was a world-class thinkers and made decisive, important contributions to 20th century theology; his more popular works, like The Politics of Jesus, demanding as they were, have inspired many to a more robust, radical discipleship in the ways and politics of Jesus. I value his work a lot. When I announced this major new text at BookNotes earlier in the eyar, I noted how many have raved about this significance of this volume. 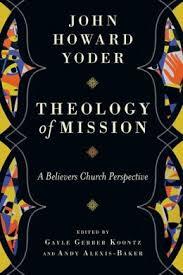 Indeed, William Willimon says, “The discovery and publication Yoder’s notes on mission is one of the great events in the history of the church’s missionary impulse.” His “Believers Church Perspective” is well worth reading. 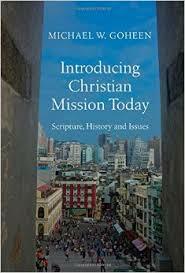 Introduction to Christian Mission: Scripture, History and Issues Michael W. Goheen (IVP Academic) $30.00 If the above Yoder volume brought a feisty, political, even anti-empire, and clear Christological contribution to missiology, this neo-Calvinist – informed with shades of Kuyper – scholar brings a contemporary, missional (even Newbigin-esque) take, giving the standard missionary topics a world-changing ethos. Goheen has co-authored book on the drama of Scripture, on worldviews at the crossroads of modernity and postmodernity, and has an amazing way of seeing the interconnections of these themes with global mission theory. It is comprehensive historical, naming all sorts of good stuff that ought to be covered in an introductory text like this. Rave reviews from across the theological spectrum grace the back. This is not only one of the best missions books published this year, it is one of the best missions books in many a year. 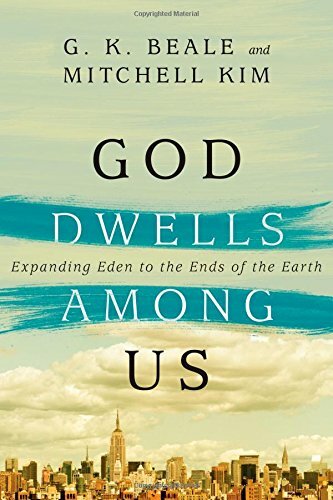 God Dwells Among Us: Expanding Eden to the Ends of the Earth G.K. Beale & Mitchell Kim (IVP) $17.00 I don’t know if this is to be shelved among other missionary books, as it isn’t exactly a book to inspire missions or to propose new missionary strategies. But yet, it is clear that the author’s heart beats with a concern about unreached people groups, and the book opens and closes with breath-taking data about how many people groups have yet to have the Bible translated into their own language, who have yet to even hear the gospel in any kind of culturally-relevant manner. This major Biblical study is framed by God’s own missionary impulse, and this is clear. In fact, this is the very theme of the book: from Genesis 1 to Revelation 22, it is God’s intention to establish and spread God’s own rule, and the Kingdom of God is seen to begin in the beginning. The “great commission” is clearly linked to the “cultural mandate” and from epoch to epoch, book to book, chapter by chapter, these authors use their painstakingly diligent attention to detail to show how God’s dwelling, God’s temple, God’s Immanuel, is the point of the whole grand love story of the Scriptures. God Dwells Among Us is honored on the back cover by rave blurbs by rigorous thinkers such as John Frame and Michael Horton. It is a work of genius, not least because it takes a massively, exceptionally scholarly tome, The Temple and the Church’s Mission: A Biblical Theology of the Dwelling Place of God (which is nothing short of brilliant) and made it more accessible, usable, helpful. The insight about the Scriptures are palpable, the implications notable, and we are sure we must name this as one of the Best of 2014. 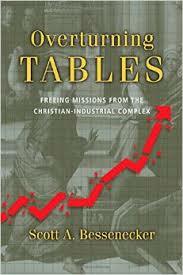 Overturning the Tables of the Industrial Mission Complex Scott A. Bessenecker (IVP) $16.00 Well, well. Well. Should I award this a Best Book of 2014? Does a thorough-going, serious, feisty critique of established Western mission work (and it’s unseemly connection to late-model capitalism) need to be so publicly esteemed? What if it just feeds cynicism or drains needed resources from the unending task of world missions? What if people think I’m just stirring up trouble? I worry about these things – can passionate protest backfire, with unintended consequences? After careful consideration, I am convinced that from my own comfortable, small town perch, I nonetheless discern that this book is spectacular, and spectacularly urgent. It is mostly right, and fully honorable, mostly wise and fully faithful. I’m sure of that. As Paul Borthwick writes, “Scott Bessenecker’s prophetic words and warnings will challenge and threaten, but they are desperately needed…” and notes that we need to be willing to do some “ruthless self-criticism.” Right or not about all the details of his call to the reform of how the West sends, funds, and manages our organizations committed to working out the Great Commission, Overturning the Tables is a book that we simply must grapple with. One friend says “it is some of his best work yet.” There have been large rumblings about these concerns for decades, of course, and this is the best summary and manifesto I’ve yet seen. Our little award is given with the hope that Overturning the Tables is taken seriously, and that because of it, God’s good work in the world is reconsidered and reformed and made more faithful. You’ve Got Libya: A Life Serving the Muslim World Greg Livingstone (Monarch Books) $16.99 I suppose we all have heard of, if not actually seen, the iconic scene in Casablanca where Bogart tells Bacall “We’ve always got Paris.” I can’t stop thinking of that, although Greg Livingstone “has” Libya in a very different way than those expat Americans, who only have romantic memories. For those that don’t know, Greg Livingstone pioneered one of the most exciting and urgent mission fields of the 20th century, taking the extraordinary work of William Carey further, wanting to reach Muslims with the gospel of Jesus Christ. Along with the likes of George Verwer and Phil Parshall, Livingstone was a quintessentially passionate late 20th century mission leader, educator, organizer. And this book tells it all, the joys and jokes, the struggles and frustrations, the plans and prayers. And lots of stories. Amazing stories. Those who have been privileged to hear him, know some of them, and this book will inspire you with others. Once he was with some high level Muslim leaders in an Arab country who wanted to build a family friendly theme park, and needed a wholesome engineer with experience in designing Disney World-level rides. They wondered if he could help. As a country closed to missionaries, of course, this was a natural “in” for Greg and his ministry, and he prayed God would help him find a “tent-maker” who engineers carnival rides and had a heart to share the gospel contextually in this repressive land (and, oh yes, would be willing to move there as an undercover missionary.) On the plane, on the way home, as he shared his missionary calling with a seat mate, the man said to him “that is so exciting, I’m a Christian, too, and I’d love to be able to use my own skills as a missionary, but no one would ever need me. You see, I design and install high end amusement park rides.” Yeah. So there’s that. If you like stories that inspire you to live dangerously for God, if you want to be a Christ-centered peacemaker in a world of anti-Islamic fervor, if you want to hear how 21st century missionaries work all over the world, from hospitals that treat radical warriors to diplomats who are open to the gospel, to village projects teaching girls to read, this moving life story of one of the amazing people I’ve ever met takes you from Penn State and Colorado to Afghanistan, North India, Libya to Kuala Lumpur, you won’t believe this fascinating journey. will be hard to put down, and harder to forget. God Is in the City: Encounters of Grace and Transformation Shawn Casselbery (Mission Year) $17.00 We are proud to note that this book isn’t widely available in many stores, as it is self-published by Mission Year themselves; we are fans of their urban work, and we are glad to help sell their stuff, so we were thrilled to tell you about it when it came out this fall. (Their handsomely designed pocket-sized book by their former Director, LeRoy Barber, The New Neighbor is also a true delight.) God is in the City is very, very special, and is very moving. It brings to the plethora of books about the urban scene an upbeat and positive tone, a celebration, even. It is easy to wring hands about gangs and thugs and drugs and police harassment, ghettos and absentee landlords. Yes, Mission Year folks lives in community in very hard places, caring for neighborhoods that are broken and hurting. And this book tells that story. But inner city neighborhoods and the lives of those who abide there are more than their problems and God is at work, also in the iconic urban ghetto. 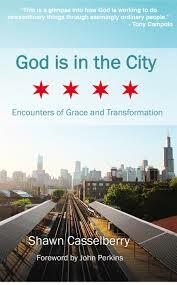 This is a book that offers a bit of a framework for seeing the city in its strengths and weaknesses, and which celebrates God-showings even in very poor neighborhoods. And it does tell some great stories of ordinary volunteers and what God has done in and through them. It is well considered, well written, and much needed. I commend it to anyone who cares about urban life, about home missions, and about holding up the dignity of people who struggle against hard odds, and sometimes seem to show remarkable goodness and grace. God is, indeed, in the city, and this book helps inspire us to shout it out. 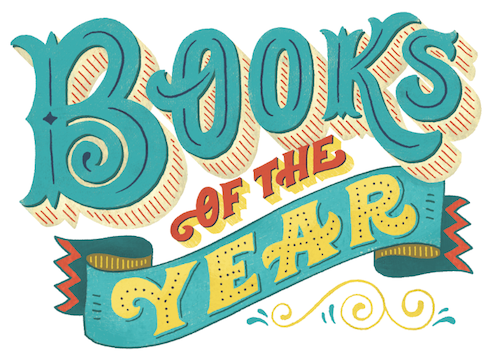 We’re glad to honor it as one of the fine books of 2014. 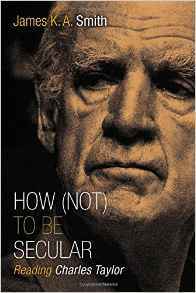 How (Not) To Be Secular: Reading Charles Taylor James K.A. Smith (Eerdmans) $16.00 I suppose you would guess that we’d honor Jamie Smith for this book, since I reviewed his work and told about this book with such gusto, here. I admitted I was in waters more deep them I’m used to swimming, and I again acknowledge that this book isn’t simple, and isn’t at all simplistic. But, having said that, I must underscore it’s utter significance, its amazing relevance, its vital role as a bit of prophecy, even, about the nature of the alleged secularism of our time. Charles Taylor is one of the preeminent philosophers of our time, a writer known for being heavy, ponderous, turgid, even. Wading through his massive arguments and dense prose takes some specialized knowledge, and Dr. Smith, philosophy professor and gifted teacher that he is, is our man. This book, then, is a book about a book, a literal guide to the insight and relevance of Charles Taylor’s big Harvard University Press tome, A Secular Age. If we were giving awards for some of the coolest things we’ve done this year -selling books with lawyers in Boston, with leaders of small rural churches in Western Pennsylvania, serving the CCO at Jubilee, traveling to Montreat College to speak to students and sell books to faculty, hosting an evening with Jeremy Courtney and his Preemptive Love Coalition here in York, and so much more —hosting the third annual Hearts & Minds Pittsburgh Summer Lecture with James K.A. Smith surely deserves some kind of award. We are still thinking about the great joy of hanging out with Jamie and his wife, and his two stunning lectures in Pittsburgh. And (if I may cut to the chase, here) his lecture offering explanations of How (Not) to Be Secular reminded me of just what a remarkable scholar and popularizer of serious scholarship he is. Smith is a fine writer, a learned philosopher, a passionate preacher, and a good communicator. He really gets this Taylor book, he helps us get it, and insofar as Taylor’s theories provide us with windows into our contemporary world, it is very, very valuable stuff. Work through How (Not) to Be Secular carefully, perhaps with others. You will be reading what is surely one of the most important books of 2014, and it will pay off in important, quiet ways. The Glass Cage: Automation and Us Nicholas Carr (W.W. Norton) $26.95 I will admit that this has been on my “must read” list for a month, now. The late fall is very, very hectic for us, and I’ve gleaned bits and pieces from reviews, interviews, and my own surreptitious time with a few pages here and there. Alas, I’ve not read this carefully. But I am sure that it is an exceptionally interesting, well written, and important contribution to our study of what our times are like. You should know Carr’s very impressive, and exceptionally important book about reading, The Shallows. 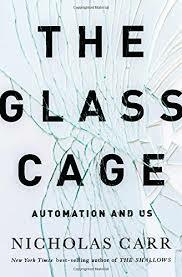 The Glass Cage: Automation and Us is a bit of a follow up to that heavy critique of how “google is making us dumb” and how our reading habits are being eroded by our use of the internets. Look: every award show has its moments, and stuff happens that is off script. 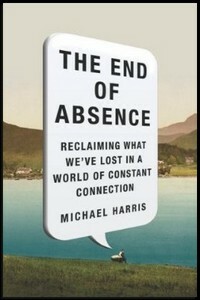 Maybe it is ghastly to award a Hearts & Minds win to a book I admit I haven’t read yet. Okay, get over it. Or tweet about it. I’m just doin’ it. Call it the best book I’m the most ashamed I haven’t read yet. Whatever. A new book by Nicholas Carr is a very big deal, and it is certainly a book that I’d regret not naming. Read the Books & Culture review by Alan Jacobs, here (although skip their amazon link, automatons that they are) and tell me you don’t agree. I am quite personally naming this one of the most notable books of 2014. 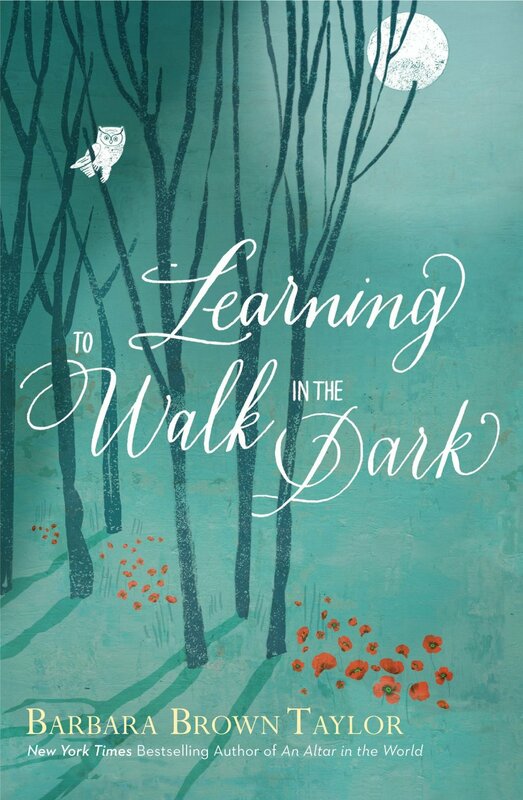 Learning to Walk in the Dark Barbara Brown Taylor (HarperOne) $24.99 In Part One of this awards list, I named a few books that are utterly solid, theologically clear, useful, upbeat books that can help followers of Jesus grow in their faith and discipleship. I don’t like the category of “Christian living” that so many Christian bookstores employ as it implies that the other parts of the store – shelves of politics, film studies, food and cookbooks, art, business, sexuality, farming, family life – aren’t “Christian living.” So we aren’t always clear what to call this category of non-academic books designed to help ordinary folks live out their faith. Basic Christian Growth seems to work a bit, I guess. Well, this one by the always elegant Barbara Brown Taylor is certainly the book in this genre I loved the most in terms of its fine writing, its artful style, its mature storytelling, its provocative theologizing. As in her wonderful An Altar in the World: A Geography of Faith she not only uses beautiful wordsmithing but helpful theology and a bit of Bible study to remind us that God cares about life, all of life. She realizes, in her liberal Episcopalian way, the doctrines of calling and vocation, and realizes we all can find, and even be, an altar to the Divine, right smack in the ordinary world. Ahh, but here is the rub: why do we fine it easier to see this in the sensational (a beautiful sunset) or the “still, small voice” but less so when in the dark, when there is no voice, not even a small one? This fascinating book holds up the goodness of the dark, literal and metaphoric, and it honors those times in our lives when God seems silent. She invites us to a nocturnal faith, and she is critical of our too glib literalism in clinging to the Bible’s own teaching about light, without an equal admission that God is also in the dark. What a fascinating, fun, provocative, literary, artful book, as she takes us on midnight walks, a retreat without electricity, a frightening experience in a pitch-black cave. I was sad when it was finished, as I wanted to keep reading. Agree or not with her conclusions, this is one very fabulous read, one of the best of 2014. 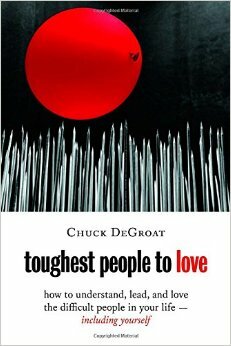 Toughest People to Love: How to Understand, Lead, and Love the Difficult People in Your Life Charles DeGroat (Eerdmans) $14.00 There are tons of good books that serve as resources for those who need information and inspiration, some grandmotherly advice or some new data about stuff we need to know. We sell books for those going through divorces, about bereavement and grief, about sexual addictions, about coping with family difficulties, those who have loved ones with mental illness, with disabilities, who wonder about death and dying. From finding a new job to learning to cook gluten free, from learning to study better, from losing weight to learning to date well, from coping with pain to learning about better conversation styles, we’ve got lots. And many are truly fine. But — wheeee — a few truly stand out, and become personal favorites, books that are so well written, are so thoughtful, so full of grace and insight, (without seeming overly didactic) that we just have to tell folks about them. Chuck DeGroat is one of these kinds of writers – his Leaving Egypt (published by Faith Alive, the CRC publishing house) is a tremendous and moving book about those in transition, needing to move on, towards grace and freedom – and we were thrilled to know he had written a new book this year. We knew it would be creatively written, graceful and good. Toughest People to Love is for anyone, and we’ve recommended it widely, although some of it is aimed at church leaders, pastors, and others who have to work with those who are hard to really love. Frankly, I am glad that I don’t need this book myself, and I wondered early on if it is as good for those with hard-to-love people in their organizations or families as it seemed. Well, I quickly found out, as a few pastors and others who needed just such a book have told me it is in fact fantastic and it significantly helped their own awkward situations. Yes, yes, this is really good stuff, wise and solid and helpful and eloquent. Kudos. A LifeLong Love: What If Marriage Is About More Than Just Staying Together? 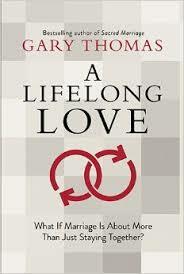 Gary Thomas (Cook) $18.99 Despite the rather technical-looking, grey cover, this book is beautifully crafted, a wonderful, chatty, charming bit of writing that can help anyone who wonders how to make their marriage more meaningful, more alive, more intimate, truly lasting a lifetime. I’ve often said that Gary Thomas is one of my favorite writers, and we stock all of his books – mostly on spiritual formation and discipleship (Holy Available) although he has a great one on exercise and health (Every Body Matters) and one called Pure Pleasure on why we should take pleasure in the goodness of God’s creation. We adore his reflective, useful, deeply spiritual book Sacred Marriage (now only available in a gifty hardback that includes the 52 week devotional with it.) I suppose this new 2014 book could be seen as a sequel to that beautiful meditation. Like that one, Thomas reminds us in LifeLong Love that our sacred unions are not so much for our own pleasure or self-actualization, but are means of grace, avenues of pursing holiness. Is God in your marriage? Do you want to practice the presence of Christ in the ordinary ups and downs of an ordinary marriage? This lively book will help. It helps you live out his big themes of the spirituality and holiness of family life. It isn’t abstract or too detailed, neither a textbook or a workbook. It is just right, interesting, informative, but well worth mediating on. This is one of the Best Books of 2014, which will be a blessing to many for years to come, whatever season of marriage you are in. There hasn’t been a book about family life that I’ve loved as much as this in years. I am positive that I want to honor this as a Best Book of 2014, and hope it gets a very wide readership. what he does, his vision for a reformation of the food system itself. And he is an intersting, vibrant writer. Malcolm Gladwell says “I thought it would impossible for Dan Barber to be as interesting on the page as he is on the plate. But I was wrong.” Similarly, Bill McKibben says that he is “as fine a thinker and writer as he is a chef — which is saying a great deal. This book uses its ingredients — the insights of some of the finest farmers on the planet — to fashion something entirely new: a recipe for the future.” Ruth Reichl, of course, raves, as does Eric Scholosser. 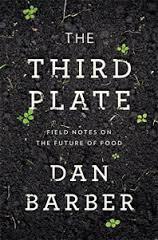 Elizabeth Kolbert says it is “one of those rare books that are at once deft and searching — deeply serious and equally entertaining.” The Third Plate is, indeed, one of the Best Books of 2014. See his ThirdPlate website, here. 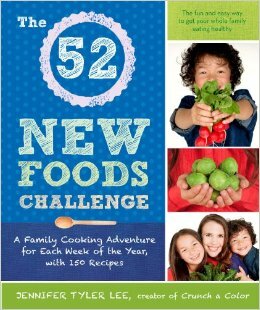 The 52 New Foods Challenge: A Family Cooking Adventure for Each Week of the Year, with 150 Recipes Jennifer Tyler Lee (Avery/Penguin) $20.00 Jennifer Thler Lee is a mother of two and the creator of the award-winning nutrition game Crunch a Color. Our kids are all grown up, and we’ve wondered if this would have worked for us. (Answer: we may not have been organized enough to fully embrace it, but it would have been fun to mess around, trying some of this with all due haphazardness.) For those who share our predilections to resist campaigns and organized plans, this could still be fun. The suggestions are hilariously interesting, the new foods and suggested recipes a surprising delight. Some you surely use, others maybe not. (Edamame? Avocados? Quinoa?) The focus on one item a week is low stress, really, and the recipes look fantastic. I like how she shows how to make it fun, how to boost variety, and her invitation to cook together. This inspires your child’s creativity, passes on solution-based ideas with thoughtful information and lots of optimism. She is gentle but aware of some of the dangers of chemicals and GMOs and the like — some food items really are ruined by typical industrial practices, we believe, and Ms Lee isn’t unaware (see the discussion she has with her kids about corn, her concerns about “the dirty dozen” and the need to eat wild caught fish, given how much junk they put in farm-raised.) This is a fine, fun book, carrying an endorsement on the back by Jamie Oliver. Check out her website at www.52newfoods.com. Very nice. I had to list three here, since there are so very many good ones. These are, I think, accessible for most readers, delightful and good. I’ll list a few more in another category that is somewhat more academic in nature, and I’ll list a few more in yet another category that I’ll call Spiritual Memoir. Look for that in the Best Books of 2014 Part Three, coming soon. For now, start with these. Soul Keeping: Caring for the Most Important Part of You John Ortberg (Zondervan) $22.99 Any year that a book comes out by John Ortberg, we are grateful, and break into a happy dance. His books are nearly perfect for most readers – thoughtful, entertaining, well-written without being too artsy, just a great blend of pastoral care, visionary insight, and helpful storytelling. He takes very mature stuff – often about the inner life, practicing spiritual disciplines, allowing God to work in our lives so that we might serve the Kingdom with great winsome zeal – and makes it accessible to read, and do-able. I recommend his work, all of it, to almost everyone. 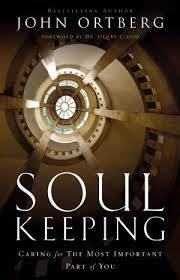 Soul Keeping is another great book from this Presbyterian pastor and “mystic of the mundane” and we are very happy to honor it as one of the best books of 2014. 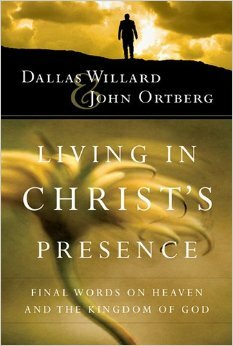 It was an especially nice read, having come out shortly after the death of Ortberg’s friend and mentor, Dallas Willard. In Soul Keeping Ortberg starts each chapter with a story about Willard, whose home he would regular visit. Is this a tribute to Willard? Not precisely, although it honors him, well — it does draw on his key insights about the divine conspiracy of God in our lives, the ways the Spirit can transform us into Christ-like people. How do we tend the soul? What does all this spirituality stuff really mean, and what does it look like? This is a great, great book, and we’re very happy to honor it. 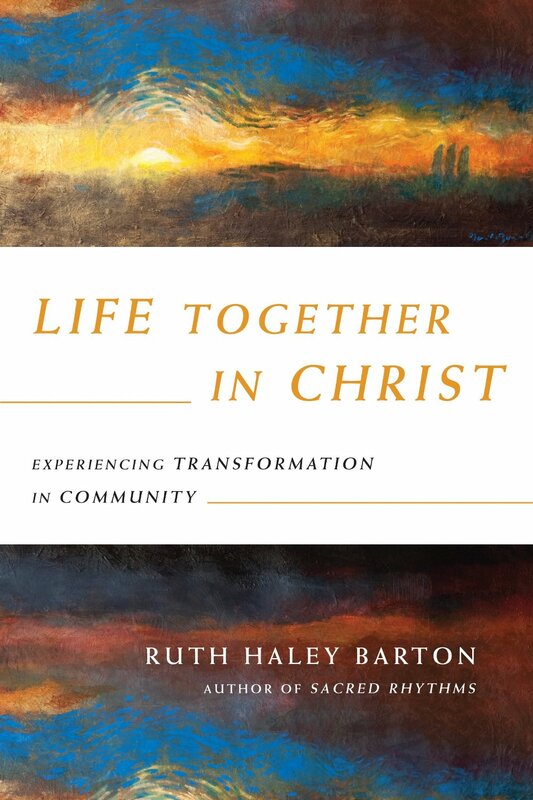 Life Together in Christ: Experiencing Transformation in Community Ruth Haley Barton (IVP) $18.00 Ruth Haley Barton, like Ortberg (with whom she once worked at Willow Creek, developing spiritual formation resources), has a natural gift, it seems, to be full of grace and charm and is able to take fairly deep, even mystical stuff, and help readers come to appreciate and imagine the plausibility of their own encounters with having this deepened nature. Her teaching (see her great DVD series Sacred Rhythms) and her writing is profound yet clear. What a gift, to be able to inspire folks to want more of God, to teach the classic, ancient disciplines, to be ecumenical and evangelical, and to actually guide readers into better ways of life, a true spiritual life. I read a lot of contemplative and devotional classics, and, to be honest, often return to Barton’s books, and always, always, recommend her to those interested in spirituality. So, yes, she’s a personal favorite, and any new book from her is sure to be a winner. This one, though, which I reviewed here, is fantastic – a must-read. It is about how spirituality is deepened in community (and how authentic community can be the perfect soil for deepening growth in our relationship with God.) This is titled perfectly: we are in Christ, and we are living life together. This is not a “how to” book for better small groups, but I commend it to small group leaders. More, it is a course on spiritual formation for small life groups. And a much-deserving Best Book of 2014. Allow me to say this, too: the last two great books released by Ruth Haley Barton have been for ministry leaders (Strengthening the Soul of Your Leadership) and for church leaders wanting to experience practices of communal spiritual discernment (Pursuing God’s Will Together.) In a way, those two were each aimed at a specific audience, and this new one may be a more general read for any of us, and certainly for any of us wanting to be involved in transformational communities. Life Together in Christ is without a doubt one of the best books of the year! Congratulations, Ruth, and thank you for sharing your heart, your life, your wisdom, in ways that help us find a transforming center. 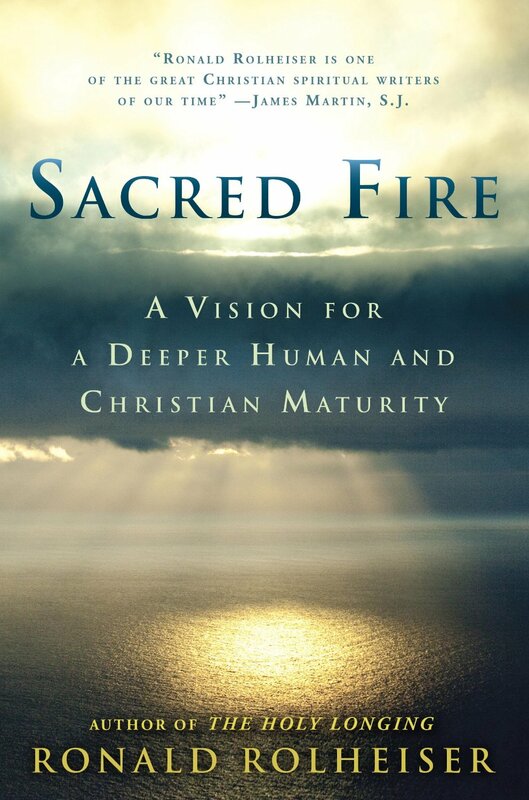 Sacred Fire: A Vision for A Deeper Human and Christian Maturity Ronald Rolheiser (Doubleday) $25.00 I suppose if you are familiar with contemporary spiritual writers and guides to the deeper life, you will know this fine Catholic priest and eloquent scholar. We take his books to any place where we display these sorts of topics. Many of us have been blown away by his extraordinary books (The Holy Longing is a true modern classic, now available in paperback.) In some ways, Sacred Fire is a sequel to Holy Longing and while it does stand alone, might be best read as a part of his larger body of work. This has been a long-awaited work, and, among other things, explores stages of faith development, and what it means to live well, even in service (“blessing”) others, giving our lives away. It came out in early 2014. I believe it will be enduring and it surely must be named on this listed, and celebrated as one of the most significant religious book published this year. Prayer: Experiencing Awe and Intimacy with God Timothy Keller (Dutton) $26.95 There have been a handful of books on prayer that I most always recommend, and for those who only intend to read one or two, I have been suggesting the same few for years. I am not sure this outstanding new release is going to supplant those simple, clear, useful books (Too Busy Not to Pray by Bill Hybels; Prayer by O. Hallesby; The Praying Life by Paul Miller; Prayer: Finding the Heart’s True Home by Richard Foster; in case you wondered.) But there is no doubt that of all the books on praying that have come out in the last few years, some serious, some silly, some clear, some weird, this is the most sound, the most mature, the most helpful, and the most commendable. 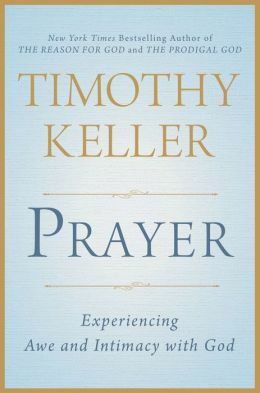 Here are the main sections, which Keller explores conscientiously and warmly with several good chapters under each: Desiring Prayer, Understanding Prayer, Learning Prayer, Deepening Prayer, Doing Prayer. It is, as you might suspect (since you surely know we are fans of the smart, evangelical, Reformed, Manhattan pastor and cultural leader) one of our favorite books of 2014. It is also one of the very best. 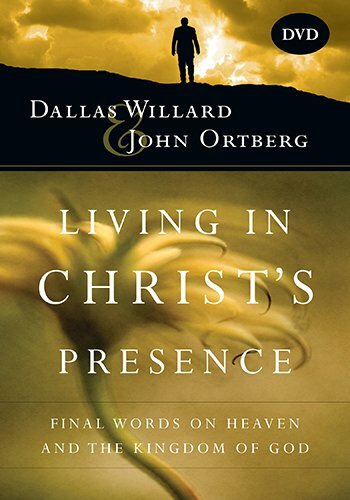 DVD Living in Christ’s Presence Dallas Willard & John Ortberg (IVP) $30.00 I should equally celebrate and honor the fabulous hardback volume Living in Christ’s Presence (IVP; $20.00) which includes the transcripts – expertly edited into a wonderfully-written book – of the live conference where these two soul friends lectured and shared deep conversations. The DVD is fantastic, mature, thoughtful. Willard was soon to be dying, we now know, and yet he retained his razor sharp logic and kindly wit, and Ortberg, ever humble and playful, teases out of the great thinker solid, useful guidance for wholistic discipleship and spiritual growth. It looks at what Willard teaches about the Kingdom of God, and the relationship between heaven and Earth. Here’s the simple format: Willard would present, and then Ortberg would interview him, drawing out with greater clarity the big truths about which Willard was so passionate. Then, in the next presentation, Ortberg would do a fabulous keynote talk, and professor Willard would then grill him, deepening the insight, drawing out the implications. Back and forth they go, one lecturing, the other responding. It is a truly great book, but you have to see it to more fully appreciate the blessed synergism of these two, the philosophy professor and the evangelical pastor. Thanks to those who turned this good event into a great book, and special thanks to those who crafted it into a fabulous video curriculum. One of the best DVD offerings of 2014. Thanks be to God. There are two lovely winners, here, a tie, as it were. I couldn’t decide, which was most deserving, but when I reviewed them both last summer, and I was very struck by both. They are both lively, will keep you engaged, and offer fresh takes on classic spirituality, lived out in the perplexities of the aching modern world. Congratulations to both authors. 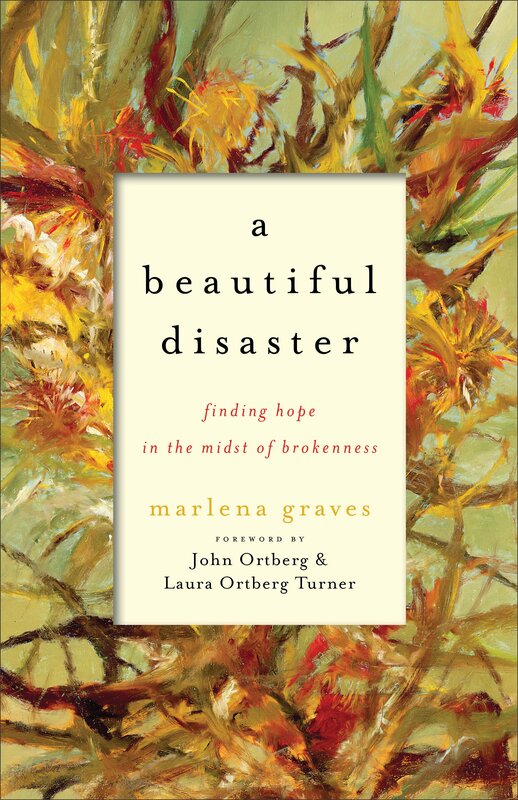 Beautiful Disaster: Finding Hope in the Midst of Brokenness Marlena Graves (Brazos Press) $15.99 If you have been with us at any book display or event the second half of this year, you may have heard me speak of this book, and may have seen it stacked up at our book displays. Beth and I greatly admire this down-to-Earth author who has put herself bravely into this wonderful book, her first. Beautiful Disaster is honorable, so we honor it, and it is helpful, so we thank her. Her fine way of blending good memoir, fine writing, and good Biblical teaching with her own journey learning the classic spiritual disciplines, makes this a refreshing, edifying book. The main theme – in case you missed it from the allusive title – is about how we can cope with hard times by nurturing our inner lives, finding a deeper walk with God by developing spiritual practices that can sustain us in the wilderness times. Is this a self-help book about enduring hardship? Is it a book about how the Bible can sustain us during dry times? Is it a book about how a young woman grew up amidst rural poverty and racial discrimination? Is it about how spirituality can form us to be people of care and goodness and justice? Yes, yes, yes, and more. The first half is about “this wilderness life” while the second explores “wilderness gifts.” The book is called Beautiful Disaster and while it is beautiful, it is certainly no disaster. It is one of the best books of the year! Found: A Story of Questions, Grace, and Everyday Prayer Micha Boyett (Worthy) $14.99 I wonder if you’ve seen this here in the shop, or picked it up at any of our book displays, and noticed not only the appealing cover, but the stellar endorsements on the back. Mary Karr, the world-famous Catholic memoirist (who calls herself “a black belt sinner.) Addie Zimmerman, author of much-discussed When We Were On Fire. Rachel Held Evans. Ann Voskamp. Adam McHugh (Introverts in the Church.) Yes, there are some edgy, cool folks saying this is the best, so I’m not alone in raving. They are correct, Found is a great story, a compelling memoir-like journey into daily prayer, inspired by the author’s discovery of Benedictine spirituality. Just when you think there doesn’t really need to be anything more written on the worldly saint — I love Benedict and that Earthy sort of “pray and work” orientation to faith, of course — along comes this former youth minister, dyed in the wool member of the evangelical sub-culture, learning the quiet ways of grace and of ancient spirituality and everyday prayer. One reviewer wrote “If you are like me you’ve grown weary of a culture that demands the sensationalistic, the glamorous, the extraordinary. Micha Boyett is in search for the beauty in the everyday.” She has a lovely tone in this book, is a great writer, and Found is a fine, fine book, which we want to celebrate as one of the best of the year. How does one say which book on the inner life is really the best? Each person may resonate with the writing, tone, and recommendations of an author quite differently. Others may like the author’s stories and illustrations, but not their practices. Others may be deeply moved, but may not motivated to put into practice new spiritual disciplines. Anyway, there are so many good ones, I had to list a few more that deserve very special honor. Here’s to celebrating these very good books which bring ancient insights to contemporary readers in a refreshing ways. 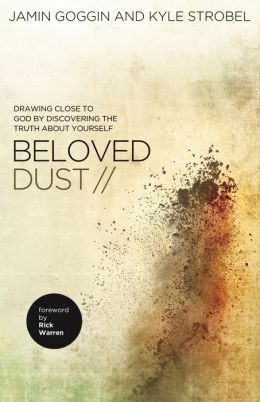 Beloved Dust: Drawing Close to God By Discovering the Truth About Yourself Jamin Goggin and Kyle Strobel (Zondervan) $16.99 These two young professors are theological Jedi knights, and I can’t believe the good stuff they’ve released (see below.) They obviously know the rich spiritual classics, have been thoughtfully engaged in nurturing a uniquely evangelical engagement with the very best writings across time. They have drawn on the best formation stuff (Strobel is an Edwards scholar, too, by the way.) But yet, they write in a conversational, modern style. This book offers a richer communion with God, a deep sense of God’s presence, that is explained in a super contemporary tone. To say this is a “cool” book is true enough, but it is also intelligent, wise, profound. It offers us the glory of God, known by us as we understand ourselves. Beloved Dust. That’s a winner of a phrase, eh? 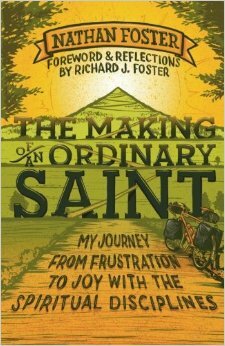 The Making of an Ordinary Saint: My Journey From Frustration to Joy with the Spiritual Disciplines Nathan Foster (IVP) $14.99 I don’t dig the cover that much, but Nathan is an outdoorsy guy, so I guess it works. And the main title and the direct sub-title explains it all. Here is what you need to know: Nathan Foster has written in another book (Wisdom Chaser: Finding My Father at 14,000 Feet) about his drifting from the faith of his family, his awkward relationship with his famous father (Richard Foster) and his eventual, slow recovery of faith as a social worker among the hurting. The elder Foster — and others of us schooled by him in devotional classics and spiritual disciplines and devotional classics — may not realize (at first) how frustrating and off-putting some of this stuff is to many. It may be somewhat a generational thing, but I think it is more than that: as Nathan describes here, Christian discipleship and the inner transformation that comes from God as we open ourselves to Christ’s presence, isn’t a cookie-cutter thing, and no one book or guru or set of practices will work for everybody. We really need a fresh take on some of this stuff. Eugene Peterson notices about this fine book that it is written “not impersonally and objectively, but as a participant.” James Bryan Smith says it is “a voice badly needed today. 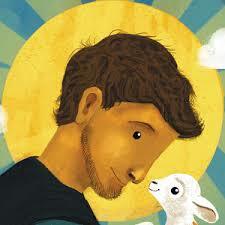 He is a storyteller whose raw honest disarms… without fear of judgement.” Imperfect sainthood for you? This is a great book. Christ-Shaped Character: Choosing Love, Faith and Hope Helen Cepero (IVP) $16.00 This book may not be written with as much elan and hip style as some by other contemporary dudes, it is nonetheless a sheer delight, a beautifully rendered book about taking ancient insights and spiritual disciplines and showing how they help us today, helping us be formed in the ways of classic virtues. Indeed, I have been known to say these past months that it is one of the best books I’ve seen on faith, hope and love. Helen Cepero trains spiritual directors and leads retreats and has written a previous little book (called Jounaling as a Spiritual Practice) which shows her own deep awareness of how spiritual practices can help us discern the presence of God in our lives. She is widely respected. Jan Johnson (who has written widely in spiritual formation) says “Cepero hasn’t just written about love, faith and hope, but about actually doing it.” Adele Calhoun (author of Spiritual Disciplines Handbook) writes, “Her gentle wisdom can help you choose life.” Cepero nearly apologizes at the end, noting that there aren’t prescribed pathways or simple road map, but we all know that’s not how these things work. The cover itself is fascinating, with nine nice photographs of different pathways. The way into love and hope, through deepening faith, is a journey. This great book is your invitation to walk it well. There is a great study guide in the back, too, so you can process the ideas, hopefully even with others. Yes, he tells stories — and they are lovely and sometimes gripping. 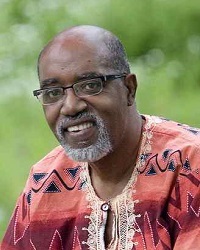 Glandion grew up among the Black Panther movement in the Oakland Bay area, and he became a church planter for the CRC, integrating spiritual formation into the life of the local church. He’s served many organizations as a chaplain, bringing his blend of social concern and prayerfulness and pastoral care together with great grace. So there are stories, but most, now, are about his quiet struggles, day by day, even the struggle with despair. In The Way of Grace he tells humbly of our remarkable God, and the great virtue of surrender. Rev. Carney, until his retirement, was associate pastor of pastoral care at St. Peter’s Anglican Church in Birmingham. His co-author is a writer who is also a member of St. Peter’s. Join us in reading, sharing, and honoring this good man and this very wise book of spiritual practices that can carry us through difficult days. Cheers! 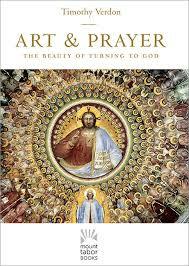 Art & Prayer: The Beauty of Turning to God Timothy Verdon (Mount Tabor Books/Paraclete) $32.50 I reviewed this at great length earlier this fall, and we have displayed it prominently in the store for months now. It is such a book-lovers delight to hold such a book, with glossy paper, exquisite full color printing of mostly older, classic artwork. Be aware, though, this isn’t firstly a book of art, but it is a reflection, even a teaching, on the classic essential art of praying. Faith and prayer, Monsignor Verdon explains, “become creative responses of creatures made in the image and likeness of their Creator relating to him with the help of their imaginations.” This book on spiritual formation is aided by fine art (Verdon’s reputation as an art historian and curator in Italy is notable.) 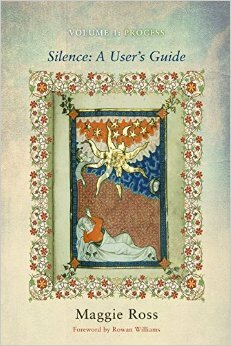 He shows here how images work as tools to teach us how to turn to God and explores in detail how prayer can become the fruit of a “sanctified imagination.” This is certainly one of the most artfully designed books on display this year, and it is one of the best on prayer and spirituality. We think the interaction of text and image deserves a special award, and we are happy to celebrate it here. A unique, special and very notable book of 2014! There is a tie here, too — more winners than I can whittle down to just one. I couldn’t decide, but when I reviewed at least two of them last summer, I was very struck by both and have known for a while they are particularly significant. The third, by Maggie Ross, is a rare find, and a deep, profound work. These are each important, offering keen insight that we need to hear. Congratulations to the authors, writers of spiritual depth and theological integrity that they are. 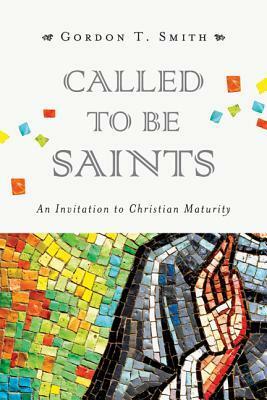 Called to Be Saints: An Invitation to Christian Maturity Gordon T. Smith (IVP Academic) $26.00 Many folks enjoy “basic Christian growth” books, and read the relentlessly, and some are obsessed with using lovely reflections about the contemplative life, seeking mystical discernment of God’s presence. But what does, finally, religious maturity look like? What are the ends and goals of practicing the spiritual disciplines? What does it mean to be a saint, to be holy, to be faithful? I doubt if Smith sees himself as a pure academic, as he writes widely in spiritual formation, and does wonderful workshops for ordinary people in the deeper life of prayerfulness and discernment. Still, it is a bit more meaty than some, and it is rewarding for any that appreciate serious work As James Bryan Smith (of Renovare) writes, “This is a much-needed book today. 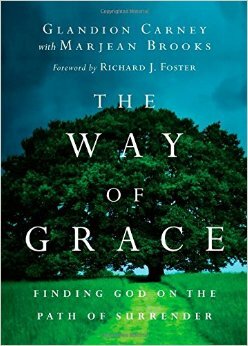 It answers pressing yet almost forgotten questions by articulating how the sanctification gap came to be and how to bridge it. This book is a wise guide to abundant living, not through self-help techniques but by learning how to live an abundant life in Christ. Read this book, study this book live this book and you will find wisdom, goodness, love and joy.” That’s why it deserves to be honored as one of the Best Books of the Year. 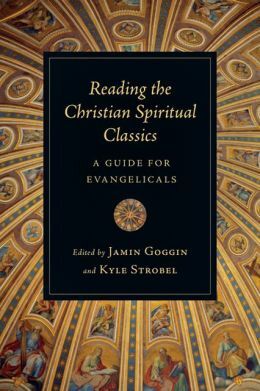 Reading the Christian Spiritual Classics: A Guide for Evangelicals edited by Jamin Goggin & Kyle Strobel (IVP Academic) $24.00 I would like to quote some of what I wrote in a longer essay about this book last summer, which shows why I think it is so very important to honor it. It offers clear-headed, centrist evangelical theologians offering their take on various sorts of great spiritual classics, giving ways to appreciate and benefit from this genre, even as some of the liabilities are named and exposed. This is generous, ecumenical work at its finest, affirming the best of other traditions, and yet reading them as evangelicals. 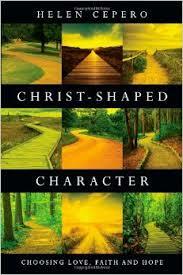 And whether you see yourself as an evangelical or not, this book will help you. For instance, here you have weighty, good chapters by the likes of James Houston, Bruce Demarest, Gerald Sittser and Tom Schwanda, weighing in on their specialty areas. For Houston that is on the genre and use of classical literature; Demarest writes on Catholic Spirituality, Sittser on the Desert Fathers, Schwanda draws on the heavy (but often overlooked) mystical elements of the Puritans. (He has an entire book on that and it is amazing!) These essays provide so much meat that it is a virtual feast. It is delicious and very, very wise. Enjoy! There are excellent chapters in this collection on how evangelical Protestants should appropriate the church Fathers and Mothers, good teaching on the Orthodox tradition, fine chapters on the monastics and why we should read them today (and with what sort of approach or bias.) Is there a uniquely evangelical way to read the spiritual classics? Must we be discerning as we read? This book offers not only the life-changing renewal that can come from engaging these old masters and their ancient writings, but helps overcome fears, offers insight into some of the foreign theological traditions from which they come, making them that much more approachable and beneficial. Here you have an absolutely unrivaled mapping by experts of the whole church’s rich, smorgasbord heritage of Christ-centered, sanctification-focused devotional writing, most of which will be unknown to most of us. What to do with it? Take it as your tour guide and start reading its recommended texts. You will be glad you did, I promise you. Wealth awaits. Silence: A User’s Guide Maggie Ross (Cascade) $28.00 Ross is an Anglican solitary, and I have read other delightful, and deeply moving, books about her commitment to silence and solitude. This one isn’t precisely an academic text, though her astute scholarship shines through this project. It is a heady blend of deep writing about contemplative prayer, the history of thinking theologically about silence (Desmond Tutu says her bibliography is “formidable”) and yet speaks in hushed tones of the heart. Originally published in the UK, we are grateful that Cascade has reprinted it here. The impressive Diarmaid MacCulloch says Ross brings “an extraordinary combination of practicality, scholarship, and prayerful reflection to this remarkable book. Readers cannot fail to profit from its many explorations, which lead to a passionate, iconoclastic, and cheering affirmation of the centrality of silence in our meetings with God.” Yes, I do believe that this deserves a very special commendation. It is a major (quiet) contribution in this year of our Lord, 2014. Okay friends, take a breather and watch for PART THREE coming soon. I’m going to be typing a lot, so get those credit cards ready. We want to honor, celebrate, and sell some books! Congratulations to the publishers, editors, writers, and you, the readers and buyers.